HG 8x56 is a superior high-end binocular made in Germany. Advanced optic technology of these Schott extra-low dispersion glass and extremely protective housing makes these binoculars a needed asset in your arsenal. This model is suitable for bird watchers and hunters observing in low-light conditions and also performs incredibly well when observing the stars at night due to 56 mm lenses. Incredible ergonomic design results in well balanced and comfortable grip of this stylish black rubber armor. Magnesium body helps to make these binoculars lighter and easier to carry and to hold in hands for longer time and can also be mounted to a tripod for steadier images. Fully M* multi-coated lenses and MinoBright silver-bearing prism coating provides with incredibly lifelike images, very bright and colourful. Central focus wheel and right eye diopter provides quick and smooth focus for comfortable use. For 15% extended field of view and quick-close-focus mechanism are suitable during peaceful observaions of the big game. Distance-scale that measures your distance to a focusing object is another very useful feature very convenient for shooting. This HG is also very durable and will never let you down in extreme weather conditions due to argon gas pruged construction against internal fogging and O-ring seals making binoculars impermeable to water, dust and debris. 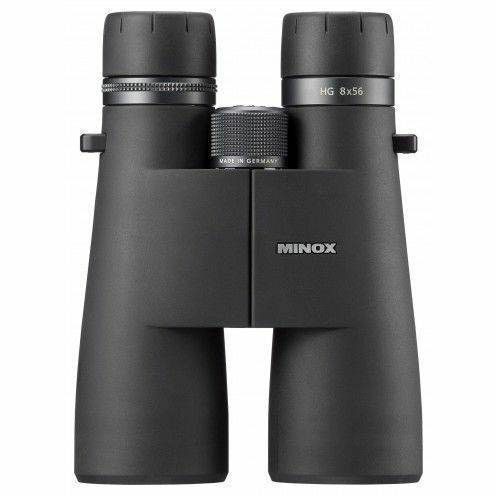 HG-High Grade binoculars from Minox Company are a high-end models made in Germany, the city with biggest knowledge and experiences in optics, Wetzlar. Advanced optic system with 21 layers of coatings together with highly light-permeable Schott glass offers high-quality images. These fully multi-coated binoculars with MinoBright silver-bearing prism coatings provide strong light transmission and thus make lifelike images; incredibly sharp, bright and colorful. You can choose between vide varieties of models for long-distance and short-distance observations during daytime and low-light conditions. Incredible award-winning ergonomic design with magnesium body will protect these binoculars against corrosion and stylish black rubber armor helps with a firm grip against impacts and abrasions. Very lightweight HG feels comfortable and well balanced in hands. Amazing protection features are the result of O-ring vacuum seals making these binoculars impermeable to water and dust and argon gas housing against internal fogging due to sudden temperature changes. High-performance is achieved by very smooth and quick central focus view and right eye diopter that eliminates differences in your eyes. Quick-close-focus together with extended FOV for 15% helps you in dynamic situations, when you need to follow moving objects and distance-scale mechanism will be very useful for shooting, when measuring distance to the observed object or subject.